Boom Mat is a simple and effective solution eliminating squeaks, rattles, vibrations and unwanted engine and road noise. No surface preparation is required and it is easy to install. Simply trim to desired size and shape, peel backing and apply. 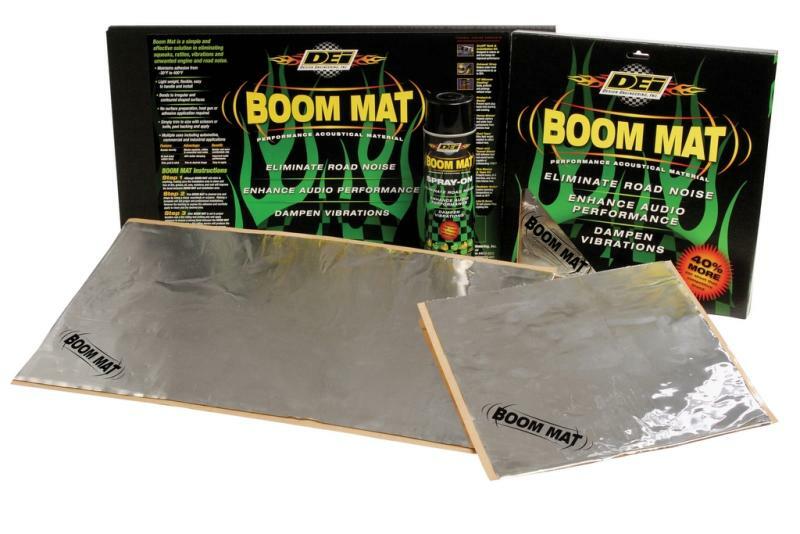 Constructed of a rubber-based (viscoelastic) polymer layer with an aluminum foil laminate outer facing, Boom Mat’s strong adhesive backing is unaffected by extreme hot and cold temperatures, is corrosion resistant and can be applied to metals, painted areas, plastic, fiberglass, automotive coatings and difficult to bond surfaces to name a few. With an ultra strong adhesive backing it can be applied in horizontal, vertical and inverted applications as well as on complex shapes. 20% higher weight per square foot than closest competitor.